Preheat the oven to 425 ̊F. Line a baking sheet with parchment paper. Peel the sweet potato and thinly slice into half moons. Thinly slice the leek, discarding most of the green ends. Place the sweet potato and leek slices in a medium skillet in an inch of water. Bring the water to a boil and blanch until tender, about 5 minutes. Drain the water from the skillet. Sprinkle the rosemary, pepper, and olive oil over the cooked sweet potato and leek slices. Toss to evenly coat. Arrange a pre-baked pizza crust on your prepared baking sheet. Spread the Dairy-Free Cheese Spread evenly over the crust. Use your fingers! 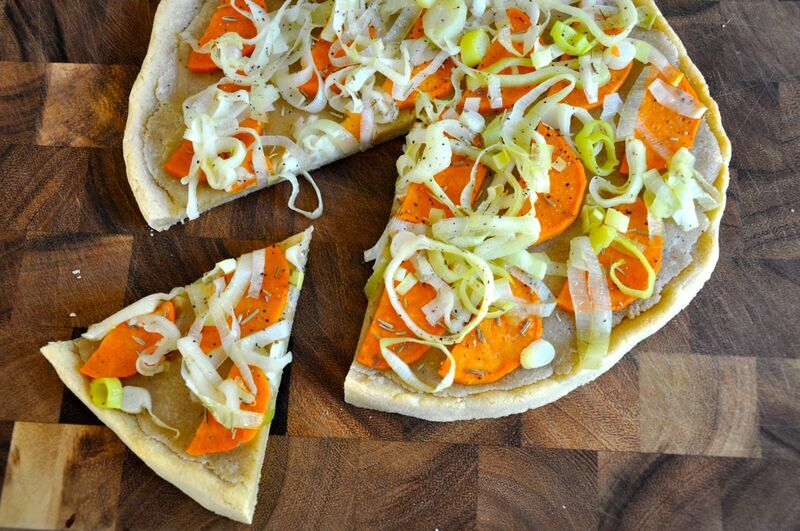 Arrange the sweet potato slices over the pizza. Top with the tender leeks. Sprinkle with extra pepper and dried rosemary. Bake for 5 minutes. Enjoy!